More than half of survey respondents said they or a member of their family witnessed a moped accident. 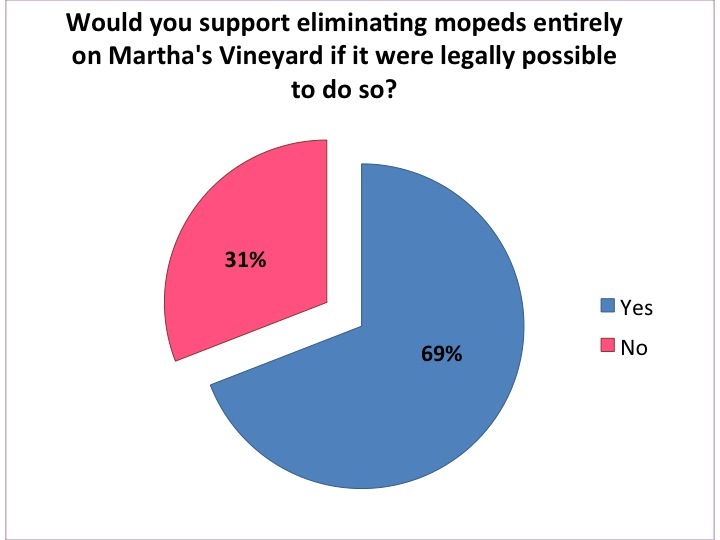 Year-round and seasonal residents who responded in equal numbers to a Vineyard Gazette community survey about mopeds on Martha’s Vineyard share strong opposition to moped rentals on the Island, with many commenting that narrow roads and inexperienced drivers are a dangerous combination. 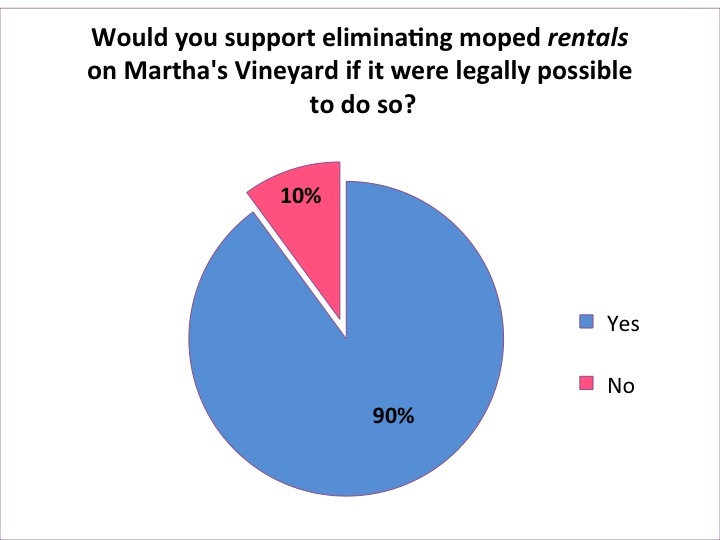 Ninety one per cent of year-round residents and 89 per cent of seasonal residents said they would support eliminating moped rentals on Martha’s Vineyard if it were legally possible to do so. And 58 per cent of year-round residents called the problem of moped rentals “extremely serious” compared to 49 per cent of seasonal residents. In just 10 days, a total of 2,390 people — including 1,098 year-round residents — had responded to the Vineyard Gazette’s 13-question online survey, designed to stimulate debate around the issue of mopeds and moped rentals. The survey closed on Monday. Although the sample of the community is not statistically valid, the survey included a mechanism to prevent multiple responses from the same computer. By comparison, just over 1,300 people participated in the Gazette’s community survey last August on ticks and tick-borne illness. A long-simmering discussion of the hazards of mopeds on Martha’s Vineyard heated up again after a crash last summer left two young women seriously injured. Shortly after the accident, moped opponents renewed an effort to curb moped rentals. Members of the Mopeds are Dangerous Action Committee recently filed a formal complaint with the town of Oak Bluffs alleging lack of enforcement of moped bylaws and problems with licenses for moped rental companies. On another front, members of the action committee, moped rental owners, police and emergency responders have gathered for discussion sessions about how to amend town bylaws to improve moped safety. Their suggestions are expected to come before town meeting voters this spring. A well-publicized campaign to ban mopeds on the Vineyard in the 1980s raised awareness of the issue, but ran into legal obstacles after a similar effort by the town of Provincetown to outlaw moped rentals was ruled inconsistent with state law. In the recent survey, comments offered anonymously by respondents suggest that while public opinion is generally against any mopeds on Island roads, rental mopeds pose particular risks. 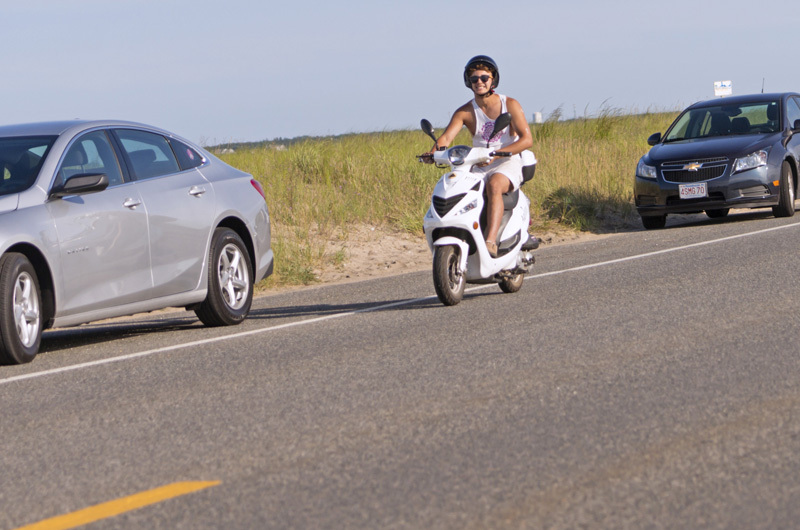 “It is just too crowded and people who come to Martha’s Vineyard for one day and rent mopeds don’t necessarily know how to drive them — let alone know their way around the Vineyard. They clog up traffic, zigzagging all over the roads,” said one respondent, in a comment typical of many. While nine out of 10 people said they oppose rental mopeds, fewer — about seven out of 10 — would support eliminating mopeds entirely on the Island. Several commented that bicycles pose an equal danger on narrow roads, and that singling out mopeds was unfair. 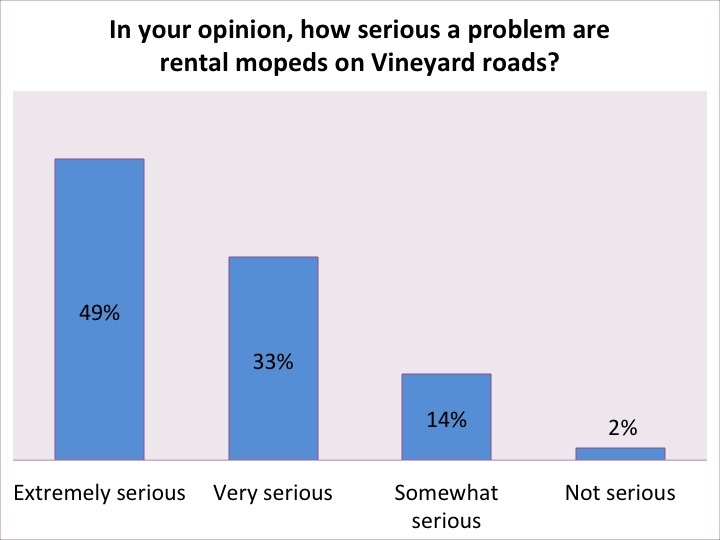 Fewer than two per cent of respondents said they or a family owned a moped and 11 per cent said they had ever rented one on Martha’s Vineyard. 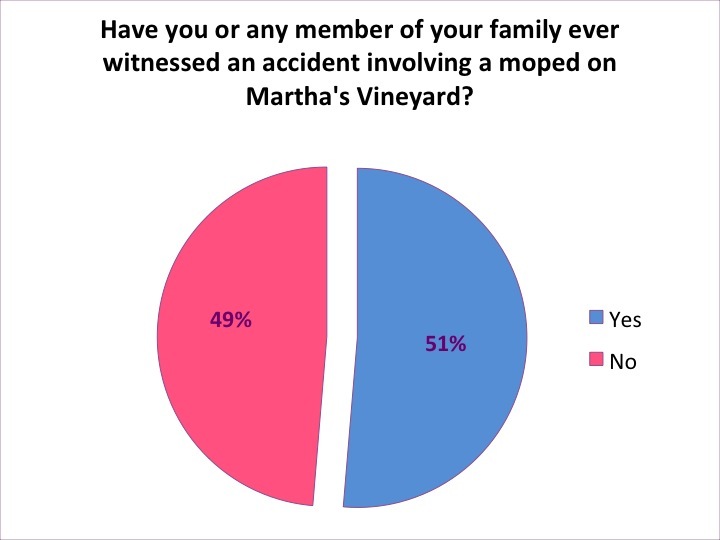 And while only four per cent of respondents said they or a family member had ever been involved in a collision involving a moped on Martha’s Vineyard, more than half of respondents (51 per cent) said they or a family member had witnessed a moped accident. The percentage was even higher — 66 per cent — for people who identified as commercial drivers or who drive frequently for work. Asked to provide comments on that question, respondents described witnessing a wide range of incidents ranging from near-misses to fatal crashes, some occurring years and even decades ago. Several said they are haunted years later by images of accident victims. The words “horrific” and “horrifying” came up repeatedly. “I’ve seen the aftermath of many accidents, people waiting by the side of the road to be picked up after crashing. My wife and daughter arrived just after an accident in Chilmark with serious injuries,” wrote one commenter. “I have seen three crashes in front of the Lookout (restaurant in Oak Bluffs), where riders make the right turn and lose their balance. Two of the crashes involved parked vehicles” said another. “When I was a child, I witnessed a fatal crash at the corner by the hospital. I still remember the screaming/crying and I know my mother still occasionally has nightmares about what she saw,” said a third. Asked whether they would support additional regulation of rental moped use if outright elimination of rental mopeds weren’t legally possible, 95 per cent of respondents said yes. Suggestions included additional licensure and training, requiring helmets, long pants and shoes, limiting rentals to one rider per moped, requiring mopeds to go single file and restricting them to certain roads. Several commenters expressed skepticism about this approach. 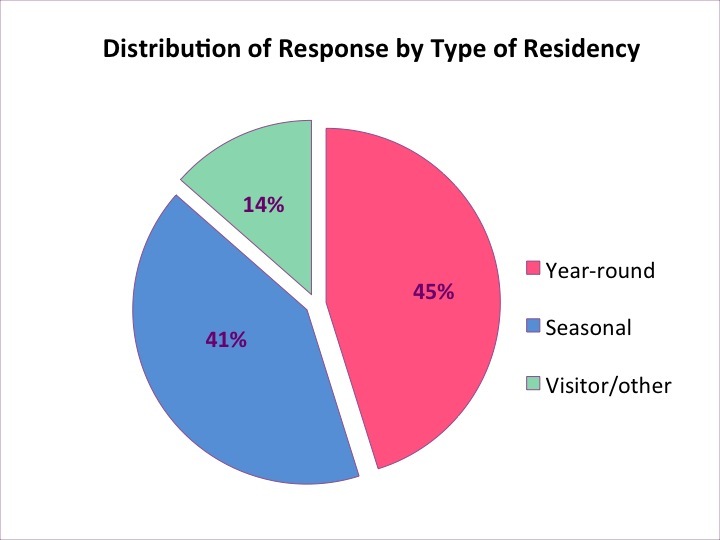 Respondents represent a broad cross section of the community. In terms of age, 13 per cent are under 40, 37 per cent are between 41 and 60 and 49 per cent are 61 or older. 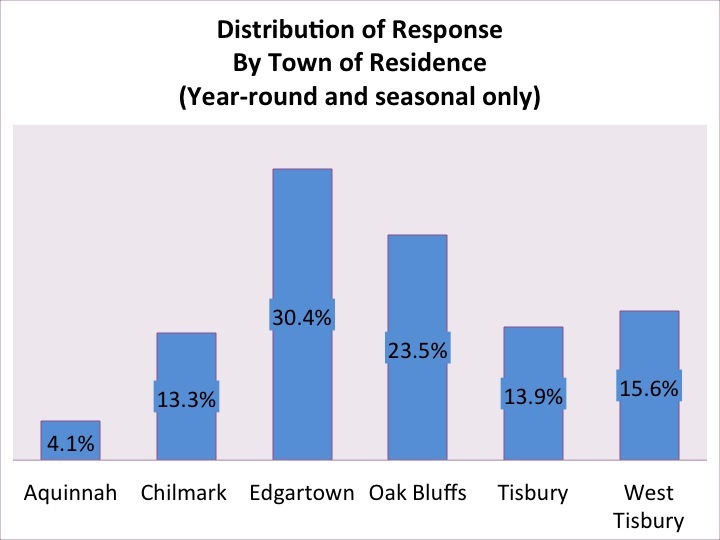 Thirty per cent live in Edgartown, 24 per cent in Oak Bluffs, 15 per cent in West Tisbury, 14 per cent in Tisbury, 13 per cent in Chilmark and four per cent in Aquinnah. Twenty-two per cent identified as a commercial driver or someone who drives frequently for work. The Vineyard Gazette Community Survey Project conducts surveys from time to time on issues of interest to Island residents, both year-round and seasonal. If you would like to be notified about future surveys, please sign up at vineyardgazette.com/survey. I just do not understand what it will take for the Board of Selectmen to take this issue seriously. By not enforcing their own promulgated bylaws, they have opened the Town up to huge liability. How many deaths and serious injuries must occur before the BOS act? MADAC has payed out a comprehensive timeline with numerous violations and years of non-enforcement. The existing licenses should be null and void. This is a survey and not the statistically valid voice of the people. It's the nature of surveys versus random samples. I don't doubt there is a large group of folks opposed to moped rentals but we should not assume this is definitive representation of the total population. While I am clearly in the minority as I am in favor of mopeds, I would like to see some actual data on the number of injuries as well the types of injuries. I appreciate this is an emotional issue but I am data driven and it always helps to have statistics as nothing speaks louder than facts. I am equally in favor of enforcing common sense laws on rental companies as safety is always a top concern, but not at the expense of personal liberty. The Gazette used to publish a running tally of moped accidents and deaths during the summer months. I bet you could find something in the archives to represent a snapshotime of data. If memory serves, between Memorial Day and Labor Day, the numbers would reach approximately 100 moped related accidents. There can only be one "top" concern and safety apparently isn't yours. You are correct, I too wouldn't want anyone to give up their personal liberty so I can have the personal memory forever of what it's like to hit, injure, and\or kill someone who drifted into my path with their moped. I am also in favor of mopeds but not the current ones being rented. Current models on MVY are unable to go the speed limit. This causes backups on the roads and increases the chances for accidents. There are many models that actually can do the posted speed limit and more. If these were rented the roads would be much safer for all. We only have to look to the city of Rome and see that mopeds can be a safe fun way to get around and reduce cars on the streets. I rode a motorcycle for years but gave it up because of my age (late 60s) and the escalating number of near accidents caused by motorists who simply did not see me coming down the road and pulled out across my route of travel- a problem bicycle riders have always had. As cars and pickup trucks grew in size, this happened more often. Air conditioning, music, texting, and on-board video features such as GPS all endanger two-wheel riders even more. The only solution I can imagine- a very expensive one- would be the creation of special lanes for vehicles under a certain horsepower, but even this would not eliminate accidents completely. Just out of curiosity,how does Bermuda deal with the problem? I see both sides of the issue. Many people who are on these mopeds are careless, but no different than careless car drivers. The stats should show the numbers of car and moped accidents. Interestingly enough in Europe all you see are mopeds even in the crazy metropolises and no cars. They whip in and out of small areas. I think the moped is a means of travel who can't afford a car, rental or couldn't get their car over on the crazy ferry system! I didn't like the bias in the questions. I believe that rude auto drivers are as much to blame for most of the moped accidents because the auto drivers force these mopeds into compromising situations! Its a two way street... if you ban mopeds, you should ban the automobile too! I agree. The automobiles are a huge factor. They're going way too fast with a bad attitude and there's too little attempt to slow them down. The banning of mopeds is a thinly veiled campaign to get them out of the way of the car drivers who dont want to be impeded. How about everybody slow down and share the road, for starters? That's been my experience...I've witnessed cars crowding mopeds and almost pushing them off the road. Perhaps there should be a size limit on vehicles on our roads. Also, speed limits should be lowered and enforced. Let's add to the discussion on moped and automobile failure to use common sense and observe existing laws, the same failure on the part of many, many bicycle riders. The Vineyard has some of the nicest, best maintained bike paths I've seen but on, and particularly OFF, those paths I've seen so many cyclists totally ignore safety concerns and state bike rules. Riding on one-way streets the wrong way and/or ignoring "NO BIKES" signs on certain streets, failure to stop or even slow down at stop signs on the bike path, taking photos with their cameras while riding a bike, riding without a helmet, riding with very young children who clearly have not been given any instruction about the two-way traffic on bike paths, etc. I remember when Edgartown Police would tell riders to walk their bikes down main street - not any more. Now, bike riders often tailgate automobiles, pass on either side, and weave in and out of traffic on that and other busy streets. A bike safety campaign by all towns and better enforcement would help a lot! You're wrong. Most of the bike paths receive no maintenance and have become so full of cracks and holes they're a danger to ride on. I'd also venture that you can't find a single driver on this Island who doesn't consistently disobey speed limits, passing lines, stop signs and, of course, sharing the road with cyclists. How exactly does the MVC or whoever should oversee the band of mopeds and possibly bicycles? There are already specific traffic rules for both mopeds and bicycles end on the rental side and become absorbed by the renter? It's just not gonna happen unless the towns prohibit moped rental business permits but even the legality of that is questionable.its almost akin to closing up ice cream stores because too much milkfat is bad for your heart. You're trying to get internet competency. The National Safety Council reports largest percentage of automobile deaths in 2015 in fifty years. The report shows 38,300 killed, 4.4 million seriously injured. Are we banning automobiles on the island? I can no longer ride my bicycle safely to the post office, the market, or for pleasure during many months of the year. Bicycle riders in Edgartown consistently ignore safe practices, drivers of huge vehicles on our village streets are rude, unsafe and bad drivers. Why are we going after mopeds? If rental mopeds are banned, is this the slippery slope we all know about? Then, perhaps, it will be privately owned two wheeled vehicles? Blame the rider, the driver, NOT the vehicle. I consider our roads to be unsafe now on the island for much of the year. Manners are almost totally absent. A lot of emotion governing this situation. Exactly right. And nobody cares. Where are the speed traps? Where is the strategically positioned and highly visible policeman on the side of the road with the radar gun motioning for motorists to slow down? Well, Oak Bluffs makes an attempt with the mobile unit advising the speed limit and Tisbury has a few visible police cars in the vicinity of Sea Glen from time to time. Edgartown? Nada. Not even a speed limit sign, incoming, beyond the Triangle. Most cars are barrelling into Edgartown at 30, 35, and 40 (or more) mph. By the time they get to the jail, they are still barrelling along and in the summer the sidewalks are filled with pedestrians and bikes, even though, by now the speed limit is 20mph, but is UNMARKED so nobody knows, and furthermore, nobody cares. This is a very dangerous situation, one that I've been railing about for years. Stay tuned. OB is the origin of most moped rentals on the Island. The town's selectmen turn a blind eye to the owners of these business and let them flagrantly violate town bylaws - even allowing them to stay in business without valid business permits. Let's see what happens April 1st when the new season's permits need to be signed off on by the Selectman. Will they duck and cover or will finally stand up? Past behavior is a good indicator of future action. It's time to hold the Selectmen accountable.